I have shamelessly stuck Gromit’s skeletons everywhere in this dark medieval castle. The castle sits on a 3x4 lot and costs $138,590. You can see a lot of the details of the castle here: http://s40.photobucket.com/albums/e...Gromits%20Keep/. 1. Download this additional file. 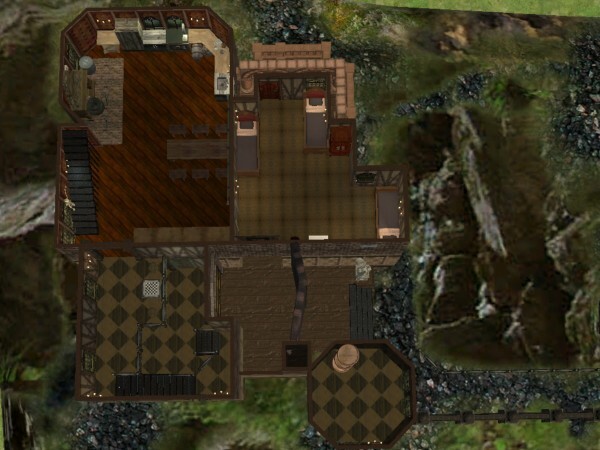 -- Targa’s Ascension V.2 Elevator, http://www.modthesims2.com/showthread.php?t=97367. It is so useful where space is at a premium and literalness is easily dispensed with. I’ve used it in the basement and tower (both of which are just for show) -- where I’m sure some sort of magical access would be expected. 2. Download the two .rar files on this thread into your download folder. Extract the files to your download folder. The extracted files will consist of two folders of custom content (cc) and a packaged lot file. You do not need to do anything else to the cc folders -- they are ready to go. Extract the lot file in the usual manner, sending it to teleport. You are now ready to go. Some notes about the images: Yes, just as you expected, the moon backgrounds have been photoshopped in. The colored spot lights you see in many of the album shots are from JGWhiteus, http://www.modthesims2.com/showthread.php?t=92373. They are not in the lot as packaged. Think of them as having been added by the photographer for more drama and interest in the images. I did not put them in the lot because first and foremost, I hate my sims tripping over the darn spotlights! Plus, they really are not in keeping with the medieval ambiance. The colored spot lights are a lot of fun to play with, and I do highly recommend them for photographic interest. Chi Sa Go, http://www.alceleniel.de/diesims2/index_eng.php. It was the medieval things that Annette has on her site that really convinced me that my next house needed to be a castle. I was so thrilled when she said yes to sharing. 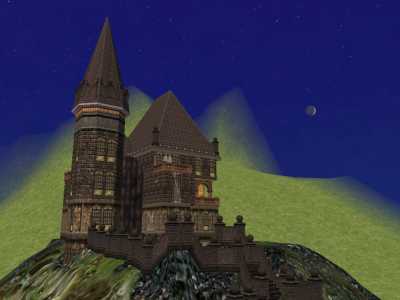 Tarox, http://www.tarox4sims2.de/, Conny is always the rock that all my medieval homes are built on. The quality, selection and uniqueness are unsurpassed. I just wish I would have seen the new bathroom set before I packaged this lot. She also has a nice selection of comfy, real life homey furnishings. 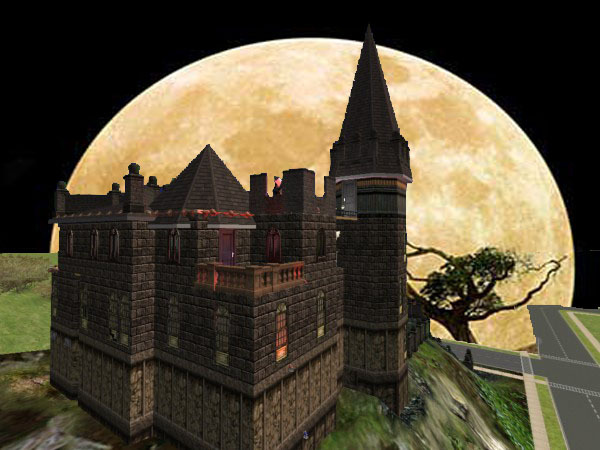 Gromit, http://www.modthesims2.com/member.php?u=45505, put the spooky in the castle. His creations -- gargoyles, skeletons, tombs and suits of armor give this the right seasonal, ancient atmosphere. It seemed only appropriate that I name it for him. 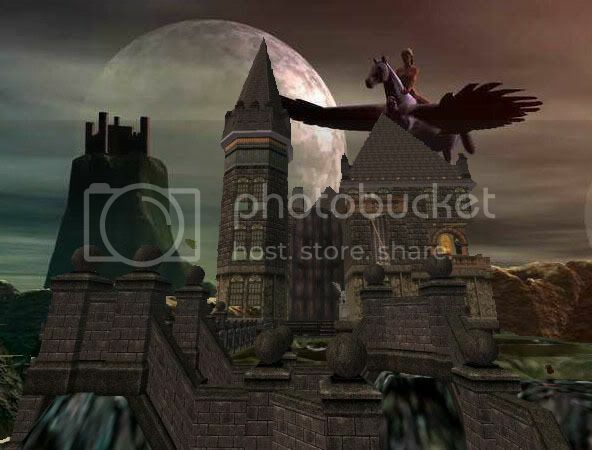 Sterling Sims, http://www.sterlingsims2.com/skyes_web_5.htm, has some of the absolute finest dark castley walls I’ve ever seen. There are many fine artists (and many fine selections) at Sterling Sims2, but Skye deserves special mention. It was her beautifully detailed walls that moved this out of the ’just a castle’ into something really special and spooky. I just love spooky that isn’t bloody and gory. 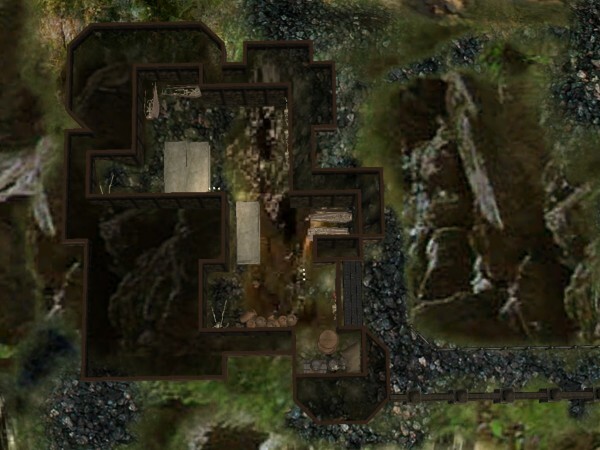 You will also find some of Sterlings unique terrains and matching floors in this lot. Komosims, http://www.komosims.net/, and her fellow creators, VonNdaSun and SimLin55 have just about used up all the superlatives in my vocabulary. The walls, floors, and terrains from Komosims is the first file I put in my download folder when ever I start a new lot -- can’t build without the fine beauty and variety these wonderful ladies have made. 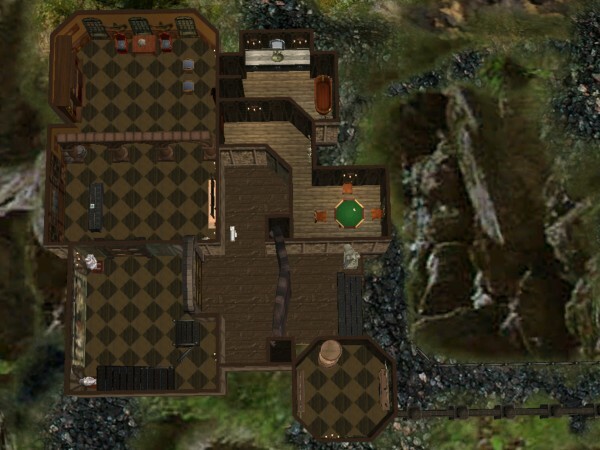 McTrick’s Place, http://www.mctricksplace.com/, the finest in dark and spooky recolor, floors, walls and fences. I just love that grimacing face fence! In addition to spooky, she has a nice selection of creations that fit nicely in older or more rustic settings. Parsimonious, http://www.parsimonious.org/, has everything -- walls, floors, plants, recolor, new objects -- you name the category, and they have it -- plus an extremely generous lot upload policy. Everything is perfectly made and delightfully unique. 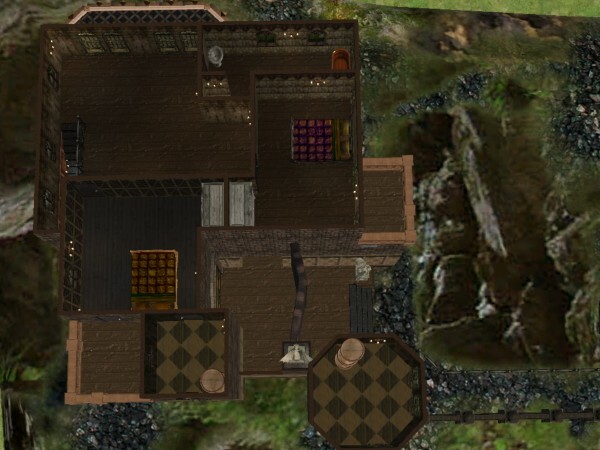 Mia86, http://www.modthesims2.com/member.php?u=200106 has made many medieval themed things -fences, walls, floors, terrains, roofs, etc. -- but perhaps her most unique are the large gate pieces you see on the front of this castle. I just love how grandiose and ancient they look! MacaRossi, http://www.modthesims2.com/member.php?u=44745, I don’t think any of her cheery posies or marvelous windows & doors made it into this lot, but you can be sure there will always be something… and that something almost always includes her roof edgings (as is the case in this lot). Please respect these fine creators. Do NOT upload this lot anywhere.